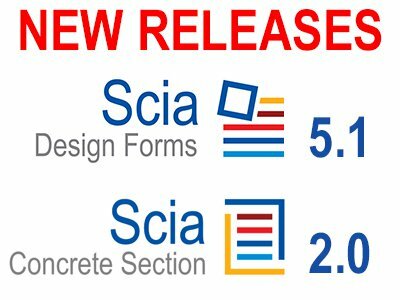 We are delighted to announce our latest releases for the Scia Design Forms platform and Scia Concrete Section with many improvements based on the client feedback. Scia Concrete Section 2.0 now supports 15 National Annexes of EN1992-1-1: Germany, France, United Kingdom, Netherlands, Belgium, Austria, Czech Republic, Slovakia, Finland etc. All Nationally Determined Parameters are set or calculated according to the methods of the appropriate NA. Check for torsion: this check is now also performed. The user can select from four section types (these are named: from torsional stirrup, inputted cross-section, effective regular and user input). Based on this selected section type, Scia Concrete Section creates the equivalent thin-walled cross section which is necessary to calculate the resistance. Torsion – shear – bending moments interaction: the cross-section is checked for all acting loads and for all parts (concrete, longitudinal reinforcement and shear reinforcement). Other improvements include: check of slenderness for columns, recalculation of internal forces and automatic calculation of creep coefficient for SLS checks. The Scia Design Forms Builder environment was also further extended and now offers dockable windows, better handling of visual styles, support of imperial units, a new architecture to handle the Annexes, new features to enable the link with the upcoming Scia Engineer 14 and Engineering Report. Most of existing forms were updated and they now include a large number of National Annexes for the following domains: Concrete, Steel, Timber, Geotechnics, Statics, Snow. The following countries are now supported: Austria, Belgium, Czech Republic, Finland, France, Germany, Ireland, Netherlands, Poland, Slovakia, Slovenia, and United Kingdom. Forms Wind and Masonry will be updated soon. Collapsible blocks: they make it possible to quickly hide or expand parts of the calculation report. Automatic update of forms: The update notification and installation mechanism applied until recently only to the software itself. Now, also updates in Forms are notified and can be downloaded and installed seamlessly. Improved output: the default font was changed to Tahoma for better readability and some pictures were updated for improved clarity. Would you like to see it for yourself? Just update your current version, or download a tryout version, and enjoy!